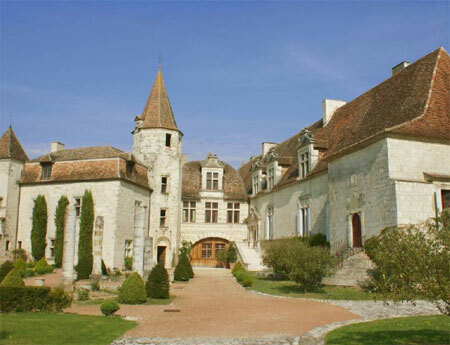 Entirely surrounded by its own walls and lying in 4 acres of gardens and grounds, the origins of this chateau were in the 12th and 13th centuries. Much of the original building was lost and it was rebuilt in the 15th century and has recently been sympathetically restored by its current owners. The property is 30 minutes from the airport at Bergerac and just over an hour from Bordeaux. The ‘king’s chamber’ is so named, according to the history of the chateau, because it regularly hosted members of the French royal family such as King Henry IV, Marie de Medicis and King Charles IX. Outbuildings in the grounds include a large barn used to house an antique car collection, swimming pool and a caretaker’s house. There is also room for a heliport.